OWC presents the Mercury Electra, a new SATA 6Gbps SSD that promises 556MB/s read speeds and 523MB/s write speeds. 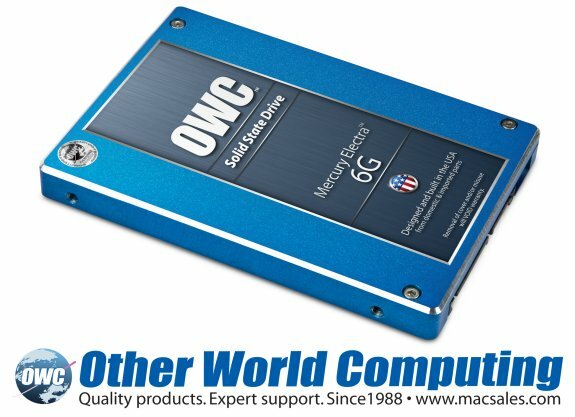 Other World Computing (OWC®) http://www.macsales.com, a leading zero emissions Mac® and PC technology company, today announced the OWC Mercury Electra™ 6G SSD, a new consumer/prosumer targeted SandForce Driven™ SATA Revision 3.0 6Gb/s Solid State Drive. Designed and built in the USA utilizing the highest quality components available, including Tier 1/Grade A NAND, the OWC Mercury Electra delivers 556MB/s read and 523MB/s write sustained data rates for over 7X faster performance than a standard factory hard drive found in Mac and PC computers.